Hello crochet friends! Hannah here. I’ve had these three country blue shades of Caron Simply Soft sitting in my yarn basket for a while and over Christmas break I finally sat down and did some brainstorming for how to use these colors to make an ombre looking baby blanket. When I first had the idea to use the moss stitch (also called the granite or linen stitch) and add white stripes, I thought I would have to weave in a million ends, but I figured out that if I carried the yarn across on some rows and carried the yarn up the side on others, then I would only have a few ends to weave in at the end. If you’ve never carried yarn before or know what I’m talking about, don’t worry, it’s super easy once you get the hang of it. Another word that a lot of people use for carrying yarn is tapestry crochet. My mom uses this technique in many of her gingham blanket patterns to easily change colors along a row. Special thanks to my mom for working up a short video tutorial to show you how to work this blanket and how to carry the yarn! You can watch the video below or you can click here to watch it on YouTube. Chain 120 (or any even number) in Dark Country Blue. ROW 1: SC in the 4th chain from the hook, *CH 1, SK 1 CH, SC in the next CH* repeat to the end of the row. (The last stitch should be a SC in the last chain.) CH 2 and turn. What I’m telling you to do is chain one after you make that first single crochet, skip the next chain, and single crochet into the next one. Repeat working a single crochet, chain one, skip over one chain until you get to the end of the row. ROW 2: Work the moss stitch across the entire row: SC in the CH 1 space, *CH 1, SK next SC, SC into the CH 1 SP* repeat to the end, working your final SC into the space between the last SC and CHs. CH 2 and turn. Translation: Single crochet in the chain 1 space from the row below, chain once, skip over the single crochet in the row below, work a single crochet into the chain one space. Repeat this all the way across and find the space between the last single crochet and the turning chains. Chain 2 and turn. On the last SC of row 2, pull through with White (you should have two loops on your hook when you pull through). Chain 2 with White and turn. Don’t cut the blue yarn. 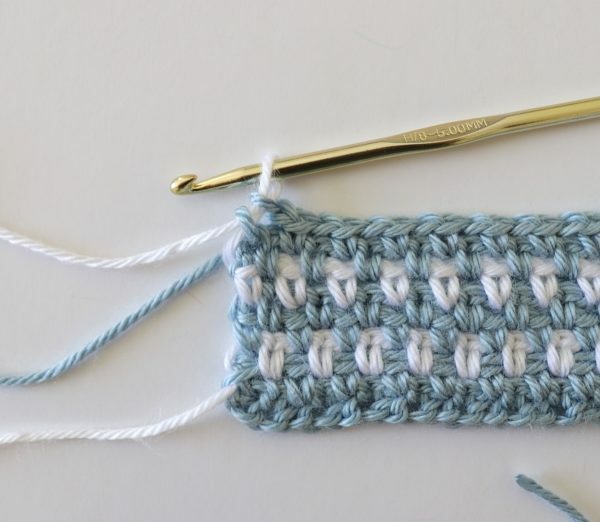 ROW 3: Pull the blue yarn around to the back and work the moss stitch (repeat row 2) across the row in White, carrying the blue yarn with you as you work. (As you can see in the picture below, I’m just holding the blue yarn across the top of the row and crocheting over it.) When you reach the end of the row, pull through with Dark Country Blue (you should have two loops on your hook when you pull through). Chain 2 and turn. Don’t cut the white yarn. ROW 4-5: Work 2 rows of the moss stitch (repeat row 2) in Dark Country Blue. On these rows, you are NOT crocheting over the white yarn. 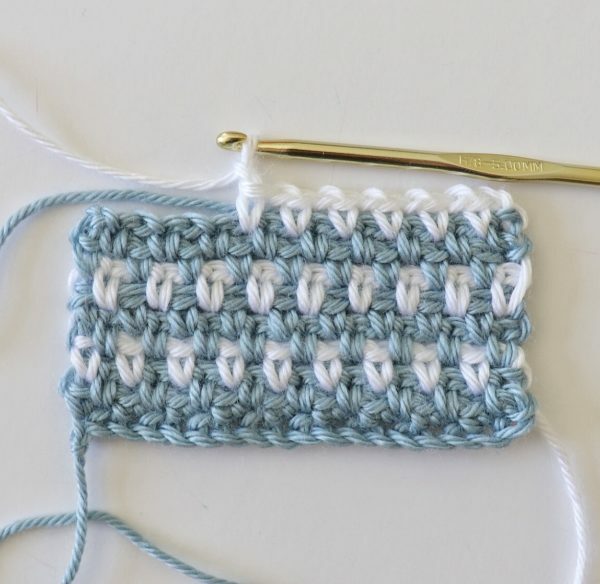 Instead you are leaving the white yarn where it is, and picking it back up when you finish your second row of blue. On the last stitch, pull through with White. Then chain 2 and turn. Don’t cut the blue yarn. Repeat rows 3-5 for the rest of the blanket. Dark Country Blue Section: 16 rows of Dark Country Blue, with a row of white in between every two rows of blue. After you have 16 rows of Dark Country Blue, repeat row 3 and work one row of White, but don’t carry the Dark Country Blue behind. Instead, cut the blue and leave a tail long enough to weave in later. Country Blue section: At the end of the white row, pull through with Country Blue and work two rows of Country Blue in the moss stitch. 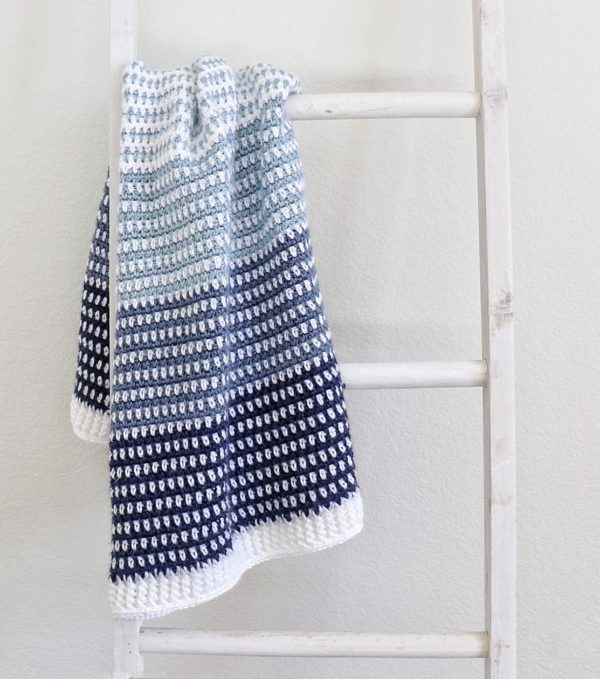 Pull through with white at the end of the second row and repeat rows 3 through 5 until you have 14 rows of Country Blue, with a row of white in between every two rows of blue. After you have 14 rows of Country Blue, repeat row 3 and work one row of White, but don’t carry the Country Blue behind. Instead, cut the blue and leave a tail long enough to weave in later. 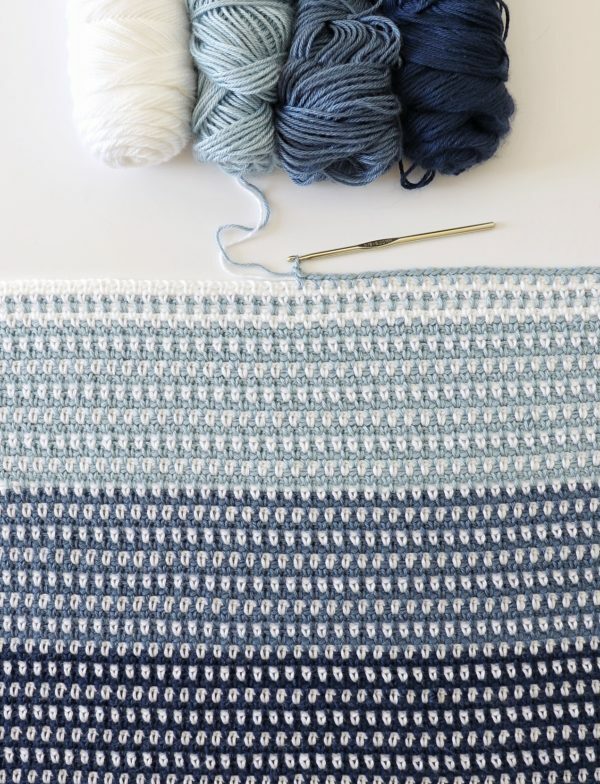 Light Country Blue section: At the end of the white row, pull through with Light Country Blue and work two rows of Light Country Blue in the moss stitch. Pull through with white at the end of the second row and repeat rows 3 through 5 until you have 14 rows of Light Country Blue, with a row of white in between every two rows of blue. After you have 14 rows of Light Country Blue, repeat row 3 and work one row of White, but don’t carry the Light Country Blue behind. Don’t cut the Light Country Blue. 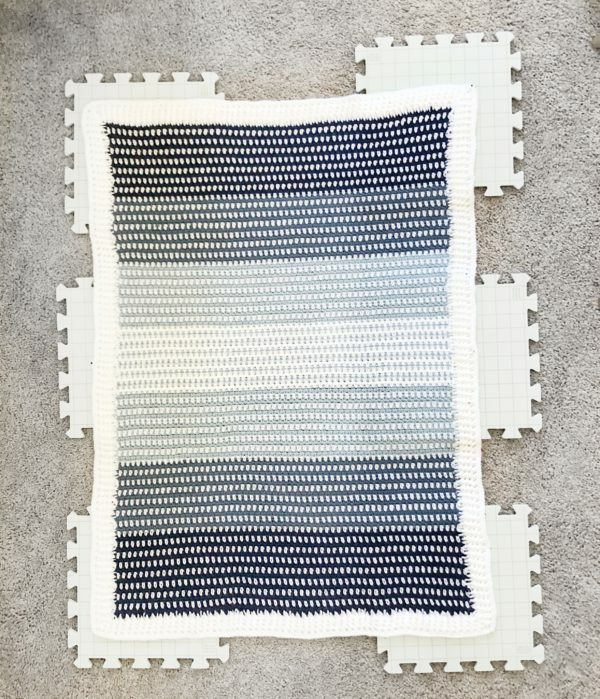 White section: You are now going to be making the white section with blue stripes instead of a blue section with white stripes, so work one more row of white, and then pick up the Light Country Blue from the side and work one row of Light Country Blue and carry the white yarn behind. Then work 2 rows of White, and leave the Light Country Blue behind. Repeat rows 3 through 5 (with opposite colors) until you have 14 rows of White, with one row of blue in between every two rows of White. 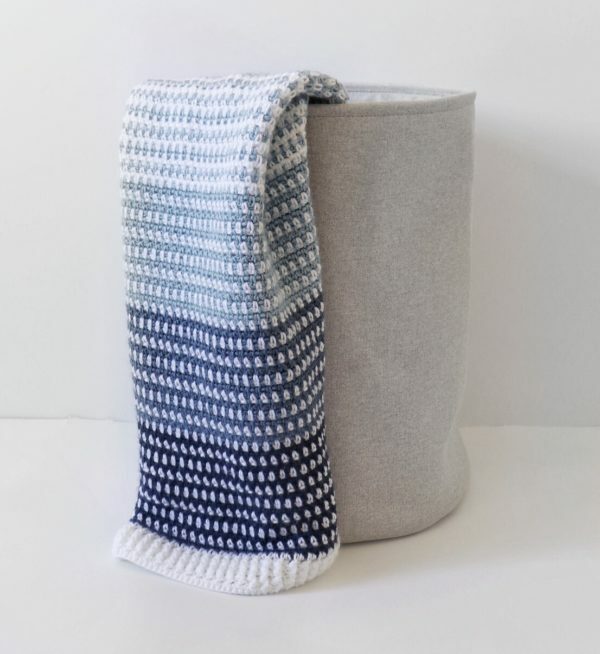 Now you are going to finish the blanket by reversing the order you did the sections at the beginning – so repeat the Light Country Blue section, then the Country Blue section, then the Dark Country Blue section. When I finished the blanket I added a front post/back post double crochet ribbed border. When I finished my fifth row, I worked one round of SC around the entire blanket to even out the tops of the stitches. I worked 3 SCs into the top of each corner stitch and when I reached the corner I started with, I slip stitched into the first stitch and tied off. After I finished my border I laid out my blanket flat and sprayed it with some water to block it and make the sides even. I actually have some foam puzzle piece boards that I used to pin down the blanket that helped out even out the corners. 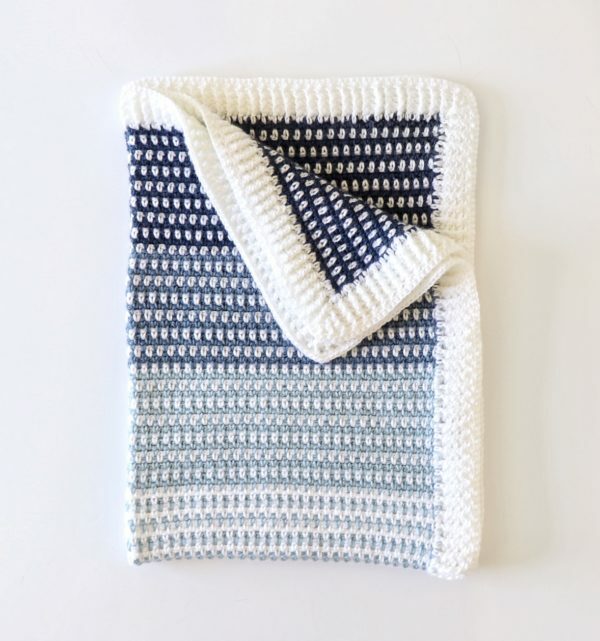 Thank you so much for coming to read this pattern, I hope you enjoy making this baby blanket! I think it would look cool in other colors than shades of blue, so don’t be afraid to experiment with some other ombre colors! When you are finished with your project please come share a picture with us on Facebook or Instagram using #daisyfarmcrafts, we’d love to see!